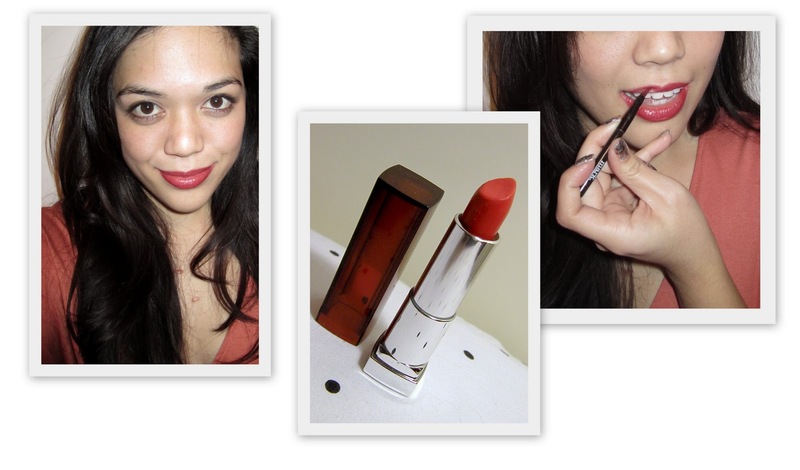 Beauty Blurb: Dare to try...red lips! I never used to be that into lipcolor, but seeing how I'm always going through style/beauty phases, it was only a matter of time. This year, I started playing around more with lipsticks and lipstains in an attempt to be a little more adventurous with my makeup (and red always looks so good on those other bloggers I read about!). So here's a basic tutorial, as well as a few tips, on how to achieve an easy, bold red lip! Start with bare lips lightly moisturized with balm. Carefully line the edges of your lips with a red lipliner (it doesn't have to match your lipstick exactly--just close enough). 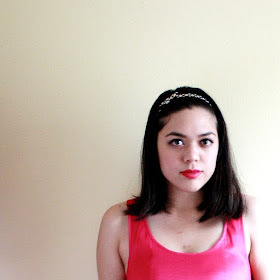 I'm using Rimmel London's Exaggerate Full Colour Lip Liner Definer in '024 Red Diva'. It's slanted, which makes it easy to line the corners of your lips, as well as the cupid's bow (the little dip above your top lip). I like this color too because I've been able to use it with different shades of red, ranging from blue-reds to more orangey reds. Press your lips together lightly to make sure the lipliner color gets distributed evenly. Choose a highly pigmented, matte red lipstick. I'm using Maybelline's ColorSensational Lip Color in 'Are You Red-dy' (less than $5 on Amazon right now)--one of my favorites. It's a nice, rich true red. The formula is creamy and stays on pretty well. Do not apply the lipstick directly to your lips! Instead, use a lip brush (nothing too fancy or anything--I got mine for about $2 at Target) and carefully fill in your lips with the color. Press your lips together to distribute the color completely and blot with a tissue to remove any excess lipstick. To keep the lipstick from getting onto your teeth (ahh! ), simply place your finger inside your mouth like a popsicle and carefully pull it out. Ta-da! Any color that would've ended up on your teeth is now on your finger! Be sure to keep the rest of your makeup minimal (I'm just wearing brown eyeliner and mascara) so that your lips stand out. What's your favorite lipstick? I'm always looking to try new brands and shades! I was selected for this sponsorship by the Clever Girls Collective. Click here to learn more about Makeup.com or become a Facebook fan by clicking here.